Tangles and Snarls | Kids' Hair Inc. 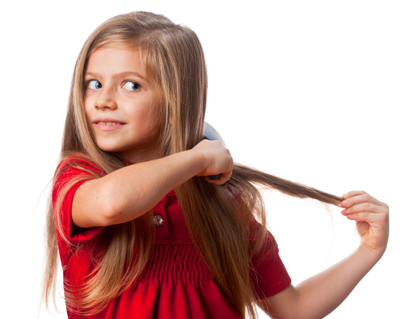 Dealing with tangles and snarls in your child’s hair can be a tearful, frustrating and time-consuming task for both them and you! When washing hair, gently massage the shampoo into scalp and through the hair, do not vigorously lather the shampoo. Use a leave-in conditioner such as Original Sprout and comb hair immediately after conditioning while hair is still wet. Before combing, always start by spraying a good detangler generously through the hair. We recommend Circle of Friends or So Cozy detangler. Use a wide-tooth comb. Start combing at the very ends of the hair and work your way up to the scalp slowly.